At a country manor in Edwardian England, a parlor trick becomes a bewitching, as one of the guests gets his dark desire. When it comes to cinematic scares, I’m a fan of suspense, not gore. So, while slashers or zombies aren’t really my thing, a film like Exit is—a creepy, subtle horror film that is more cerebral than outright shocking. It’s the kind of film that sticks with you, messing with your mind and keeping you from sleep when you’re alone on a cold night. Based on an Edwardian short story of the same name by Harry Farjeon and adapted and directed for the screen by Daniel Zimbler, Exit keeps the viewer on edge with nothing but psychological tension and strong performances. There is no blood. There are no jump scares. In that sense, it feels like an old school Twilight Zone episode—as I watched I was practically waiting for the camera to whip pan and reveal Rod Serling taking a drag on a cigarette (that’s a compliment in case you were wondering). The films starts slow but quickly escalates from the innocuous to the macabre. The transition from one to the other is seamless—it’s a suspense-supernatural-thriller that manages to sneak up on you. Combine this with the fact that the film takes place in one location with no major action beats, and it’s hard not to be impressed by a story that accomplishes so much with so little. Of course, beyond Zimbler’s keen directorial sense, a lot of the film’s success is dependent on the performances. 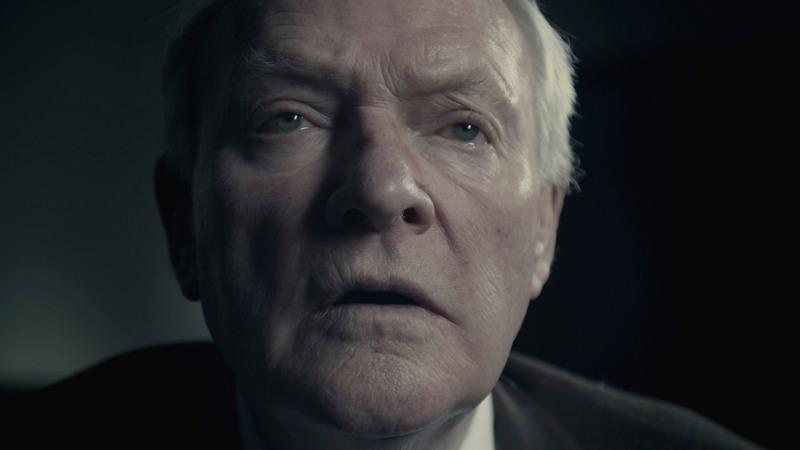 Exit really delivers in this department, featuring legendary actor Julian Glover (The Empire Strikes Back, The Last Crusade, Game of Throne, etc.). His delivery is sublime—creepy, but also surprisingly engaging. His performance is the glue that holds the relatively simple production together.